PRIMUS® manhole covers, kinds of BMC / Polymer concrete manhole covers are made of BMC (Bulk Moulding Compounds), with metal framework by new technology. The products were SABS (SANS 1882:2003) approved. Nowadays in South Africa it is a trend for BMC manhole covers to replace iron cast ones as sewer/drain covers and underground cabling or piping covers by its advantages of non-recycability, lower cost and undoubted weight tolerance. Now Afrasian Business is the sole agent of PRIMUS® manhole covers in South Africa and Africa continent. PRIMUS® manhole covers have been in South African market since 2007, the sales escalate annually as BMC manhole covers known and accepted gradually in the construction industries. Up to now there has been no complaint or return of our sold products from our clients. We offer 5 years replacement guarantee on our products sold. PRIMUS® manhole covers offer varieties of Shapes and Sizes which fulfill the different functions for the covers of sewerage and drainage, communication cable piping, water and electricity piping, as well as gas piping, etc. PRIMUS® manhole covers are your first choice to purchase. 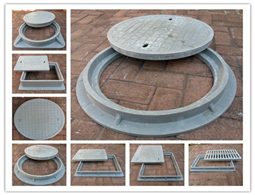 For futher information about our products, please visit the website https://www.manholecover.co.za .